On a warm, sunny Wednesday in May, I boarded a Montgomery County Ride-On bus for a spring tour of the Agriculture Reserve. Along with our hosts, Montgomery County’s Office of Agriculture, we started our adventure at the Agricultural History Farm Park, a 455-acre park that lets visitors enjoy the past, present, and future of Montgomery County farming. Our bus group included eager representatives of County business and government – all nature enthusiasts – as we set out to explore four different areas of the sprawling, incredible Agricultural Reserve. But first, a word (or two) about the Ag Reserve. It encompasses 93,000 acres, and for scale, that’s more than twice the size of Washington, DC. Created in 1980, the Ag Reserve expands over a full one third of Montgomery County’s land with a mission to protect and preserve its farmland and rural spaces. With free roaming dogs wagging tails at our sides, owner Eric Spates explained that his 1,100-acre, family-owned farm produces soybeans, corn, wheat and hay. In fact, Eric’s farm is one of the largest hay producers on the western side of the county – a good thing since parts of Montgomery County are very much horse country. The rural life runs through Eric’s blood as his family has been farming in the Poolesville area for seven generations. His is one of 540 farms in the County. He understands the value of his larger farming community, serving on the National Association of Wheat Growers and other civic organizations. Eric shared his latest ‘smart’ tractor which uses satellite GPS to scan fields to ensure most effective and efficient fertilization and harvesting processes. 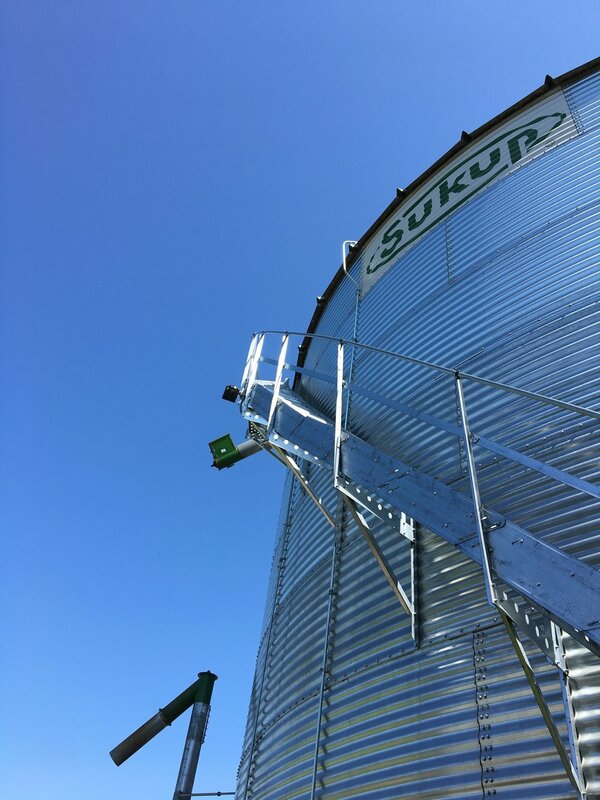 For the non-acrophobic among us, we were invited to climb the steps of a giant, gleaming silver silo which stores corn – for a panoramic view so expansive, you almost forget you’re still in Montgomery County. After passing a rustic backdrop of farmland and open space, our next stop was the Poolesville Golf Course, with interesting changes on the horizon. What’s a great way to boost the wine industry in the County? How about a 6,000 square foot grape-crushing facility along with a 15,000 square foot banquet hall, all part of the Montgomery County Revenue Authority’s (MCRA) Economic Development initiatives. MCRA CEO Keith Miller shared the incredible blueprints that line a pavilion wall showcasing this public/private venture expected to launch in 2020. What a great catalyst for growth in the Ag-business, which contributes $287 million to the Montgomery County economy. Build a grape crushing facility and they will come – that is, aspiring winemakers who want to grow grapes in the region without the resources to invest in the expensive equipment. County and state funds will contribute to this partnership to promote agricultural economic development. Local universities are on board with plans for training programs – in-class and onsite – in Agri-tourism, viticulture, business entrepreneurship and culinary arts. Academic partners include the University of Maryland’s College of Agriculture & Natural Resources, the University of Maryland - Eastern Shore and the Universities at Shady Grove. In addition, Montgomery College is planning a certification program for vineyard management. But for now, back to golf. The MCRA also oversees golf in the county, running 9 beautiful golf courses including Poolesville, on 2,200 acres of land. Golf and grape crushing, anyone? I remember Homestead Farm as a place I brought my kids for pumpkin picking. But Homestead is so much more than pumpkins. Owner Ben Allnutt greeted us, another farmer with a happy flock of free roaming dogs, to talk about his experience on a 230-acre, family-owned farm. Our group jumped on a tractor-pulled wagon to explore the expansive farm, which also includes another 300 acres of leased land. People come from around the region for their apples – more varieties than you even knew existed – along with peaches, blackberries, blueberries, strawberries. Natural sweetness is very much on the menu at Homestead’s Sugarland Road address. The crop also includes seasonal vegetables including corn and squash. Popular with families for the pick-your-own fruit and flowers, it also hosts school field trips to introduce the farming life to kids. For those who prefer not to forage through the fields, there is a nicely-stocked farm market on the site. Goat, sheep and other farm animals greet our group with enthusiastic bleating and Baa-ing. And in the fall, the place is teeming with families eager to pick a pumpkin, take a hay ride, or pet the farm animals. It turns out that Montgomery County is the number one pumpkin-growing county in the state. A trip to Poolesville isn’t complete without a visit to Homestead Farm. Wondering about farming longevity in Montgomery County? Homestead has been a part of the landscape since 1763. On the way to our final stop, we hear more about the 10,000 horses that make a home in Montgomery County. About 60 of the lucky ones are housed at Wyndham Oaks Farm, an award-winning dressage and boarding stable. With carefully ventilated, well-kept barns, you imagine life is pretty good for the horses who board here. Owner/operator Lori Larson takes us on a tour of the barns with cathedral ceilings and skylights, exterior Dutch doors and windows in every stall. Four seasons long, these horses are extremely well cared for. On to the indoor Olympic-sized arena, nearly 200 feet long, designed by a well-known area architect. With large translucent window panels converted from airport hangar doors, the arena gives an open-air feeling to the space. A professional sound system provides music and voice over for the full arena and lounge areas. No detail has been unmet. Wyndham Oaks Farm also has a beautiful community clubhouse for the 2-legged variety of friends. Located in the heart of the Ag Reserve of upper Montgomery County, it is surrounded by miles of hay fields and a network of maintained trails. Wyndham Oaks is proud to be the first equestrian facility in Montgomery County to become a Farm Stewardship Certification and Assessment Program (FSCAP) Certified farm, recognizing exceptional stewardship of the land. The fabulous day ends back where we started, at the Agricultural History Farm Park. For those inspired to visit the Ag Reserve, summer brings the 29th Annual Farm Tour. Mark your calendars for July 28th and 29th for a chance to visit 20 incredible Montgomery County farms. Lynn Stander is MCEDC’s Senior Copywriter. She was born in Miami Beach, grew up in Baltimore, and has spent many years as a Montgomery County resident.